I have to admit that I actually haven’t seen this latest blockbuster directed from James Marsh and will most likely wait until it appears on Blu-Ray, where I won’t have the luxury of listening to others I am forced to sit with, talk about their mundane lives or stuff their faces with popcorn (I abhor cinemas). In one sense it does mean however, I can listen to the soundtrack as a proper album; and judge it on its musicianship alone. ‘Cambridge 1963’ provides a bombastic piano led orchestration huge proportions with a galloping string section that blends into ‘Rowing’ with gusto; and the simply gorgeous ‘Domestic Pleasures’. However, as undeniably beautiful as this is, this soundtrack suffers from the same issues that most have; the songs themselves are extremely short in length due to them providing a brief moment in scene chapter backdrops. When I found something I truly adored, it was over before I could lose myself in it completely. Over the course of 27 tracks (and this album must be played as a whole in one sitting to gain any benefit) the piano stands out as the key instrument in pulling at the heart strings and taking the listener on a teary-eyed voyage of emotional heartache and the genuine drama of the story it is portraying; coupled with exceptional strings that drift and weave through every core of your being. 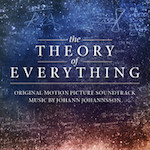 The real genius in this release is Jóhannsson himself; he is of course no stranger to producing soundtracks, but it’s the way he produces them that provides the true magic to this release. A lot of this album has been produced electronically, but you wouldn’t be aware of it aurally speaking; and occasionally he does allow the analogue of real orchestration to play alongside from the comfort of the Abbey Road studio. The blend works well and electronic keyboards become just one cog in one well-oiled machine. Striking in parts and as challenging as it is easy on the ear, high marks are attributed purely on Jóhan’s abilities alone, but are pulled down on album playability. This official soundtrack has been produced to add that essential enhancement to what may be a movie of epic proportions (and I am sure the music does do it justice); this just suffers from what I attested to earlier, with the songs themselves being all too brief to be appreciated as much as they should.